Spice up your holidays with these Christmas recipes from the Thai kitchen! Thai food is bright, colorful, and oh so delicious, making for some of the best side dishes and finger foods for your holiday table. Here's to a delicious Christmas and a happy and healthy New Year! This recipe is simple to make and it'll give you that incredible flavorful satay you're looking for. 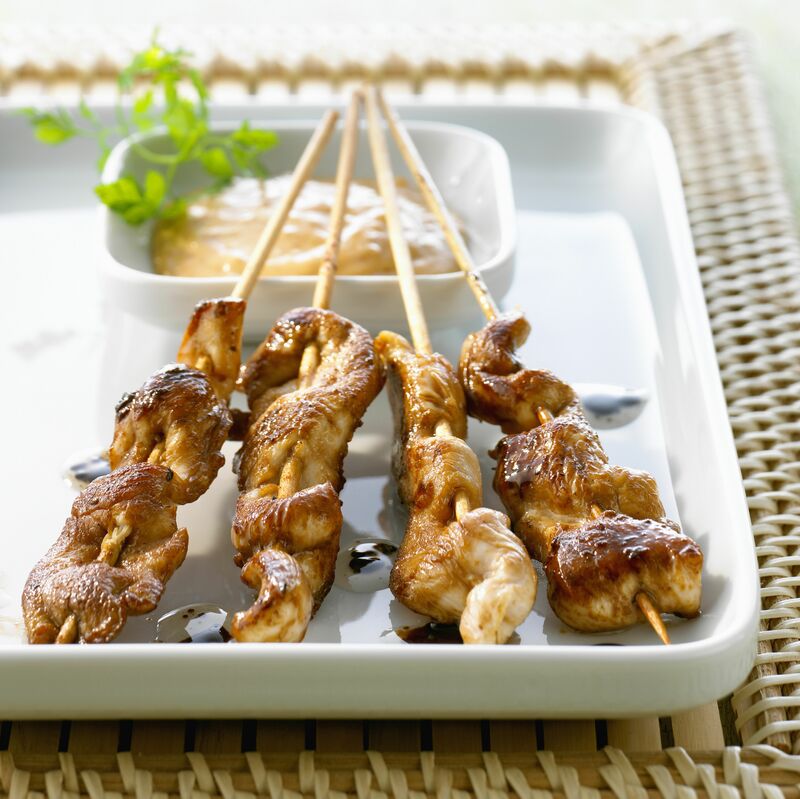 Satay party sticks is always a huge hit with any crowd, as well as a special taste treat for your family - just perfect for the holidays! This dragon fruit martini is easy to make and beautiful to serve for your holiday get-together! Your guests will be surprised and delighted by this refreshing cocktail, and the marvelous-looking dragon fruit also makes a great conversation starter! Dragon fruit, which is native to Thailand, is now readily available throughout North American supermarkets, Asian food stores, and most fresh fruit markets. If you enjoy crab cakes, you'll love mini Thai fish cakes! They're more flavorful than most Western fish cake recipes, plus they're easier to make. You can serve them as an everyday dinner dish together with rice or over salad, and they're also terrific for a party (as pictured here) because they are small enough to serve as finger food. They can be made up ahead of time too! This ancient special Thai orange seafood soup is bright and festive to serve during the holidays. In Thai, it's known as "Geng Som Pla" - which actually means Orange Fish Curry" - a very old recipe from the Central Plains region of Thailand. It is a fiery-hot soup with both sour and sweet overtones that make for a lively combination, especially when paired with your choice of fish and/or seafood. Plenty of fresh local vegetables are used in this wonderfully soothing Thai soup. Great to serve as an appetizer for your holiday table! Lemongrass chicken is a popular dish during special occasions in Thailand, and this Thai roasted lemongrass chicken recipe is particularly fragrant and moist. Imbued with the flavors of both lemon and lime, you'll find this roasted chicken delicious as is, or serve it together with my sweet lime sauce for a delectable Thai treat your family and friends will absolutely love! This vegetable platter with easy Thai peanut dip makes quick work of making up a vegetable party platter - perfect for your Christmas party or gathering! This peanut dip is made the authentic way: with real peanuts (instead of peanut butter) - and you'll taste the difference! A healthy alternative to the usual holiday finger foods, and it's good for vegetarians and vegans too! This easy Thai coconut rice makes a wonderful side dish for any entree you might be serving up. With its pure white color and occasional flakes of coconut, it resembles snow with the taste of all things 'Christmas-y'. Serve it with my Lemongrass Chicken for a delicious change from the usual 'turkey & mash'! This pretty pandan sticky rice layer cake is perfect for serving around the holidays, and it's much lighter and healthier than our Western Christmas cakes. This is one of my favorite Asian cakes, and it isn't difficult to make. Give it a try! These easy glazed Thai cashews are a tantalizing combination of sweet, salty and spicy, making them an excellent beer nut or snack food. Perfect for the holiday season, these glazed nuts can be made in a matter of minutes and served alongside your party platters. Great with beer and cocktails, but also delicious sprinkled over salads or desserts (excellent on ice cream!). Or fill a pretty jar with these glazed nuts and give them away as a gift to the Thai food lover on your list! This easy Thai-style creme caramel dessert is great to serve during the holidays, especially if you can find pandan paste from your local Asian food store (it lends a green coloring and amazing flavor to this dessert). A terrific make-ahead treat, this simple dessert is also beautiful to serve. These pandan sticky rice balls with coconut will be a hit with anyone who enjoys that wonderful sticky rice texture that comes with Asian/Chinese desserts. The green coloring comes from Pandan paste (a herb), and they also feature a sweet sugar filling and flaked coconut on the outside. They sound sweet but are actually much healthier and lower in sugar than most Western desserts. They're also fun to make (like playing with play dough!). Your kids will enjoy helping you make up a batch!